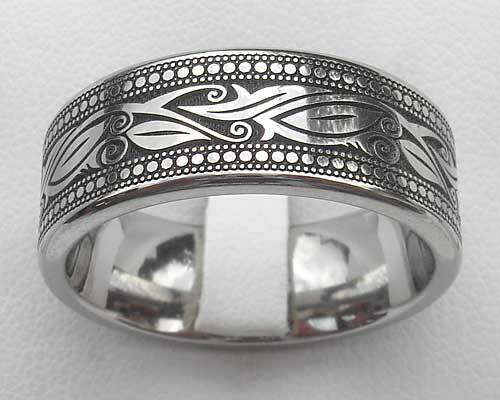 Modern Celtic Leaf Titanium Ring : LOVE2HAVE in the UK! 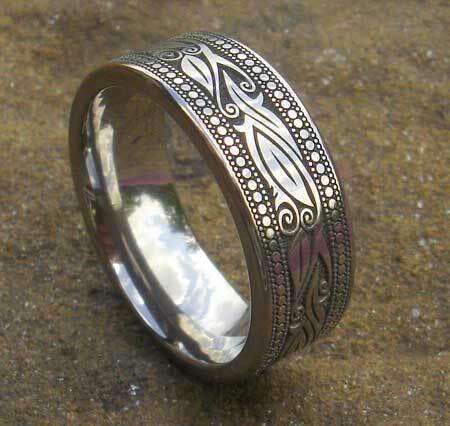 A titanium ring with a Celtic leaf outer engraving. At Love2Have we love the UK made outer engraved Celtic titanium rings we sell and as the years go by the designs become more and more stunning, especially none more so than the ones that reflect the natural world around us we think. This beautiful ring is the latest example and features an intricate tessellated modern leaf or vine type pattern that runs around the rings outer face. We believe that this design reflects a slight Celtic or spiritual quality and would appeal to anyone in tune with nature. Remember, the Celts had a deep affinity and understanding of the natural world. The ring also makes another option compared to the English oak ring we sell with its more contemporary design. The leaf pattern is encompassed by additional repeating dot detail adding to the stylish design. The laser engraving leaves a pitted surface which adds to the natural theme of this ring too. The width is 9mm which makes it quite a substantial piece of jewellery, most definitely suited to a man and it is available in either a satin or polished finish.